﻿ President's Message | NHI - Nursing & Homemakers Inc. Nursing & Homemakers Inc. was founded in 1985 when I saw the need for supplemental nursing personnel in hospitals, long-term care facilities, and homecare in the community. Back then, I was employed as a nursing coordinator in a major teaching hospital in Toronto. There, I noticed a significant and critical gap in service immediately after patients were discharged from hospital; there was often no one at home to assist in their care. These days, with the thrust to realize reduced healthcare costs, patients are often discharged early from hospitals. When patients arrive home, there is an urgent need for quality (sometimes specialized) care. Many times, family members simply cannot provide the type or intensity of care that is needed. In such times, a nurse or professional caregiver is always a very cost-effective option. At Nursing & Homemakers Inc. our nurses and caregivers have specialized skills that can be customized to meet your needs 24 hours per day, 7 days per week. Whether you are on a ventilator at home, in need of palliative care or you require a caregiver for day-to-day personal needs, we will assist you. We are just a phone call away. It is not unusual for many of us to turn to the internet to find the information that we need. We shop online for many things. But, I believe that an online search is woefully inadequate when a family requires quality homecare services for a beloved family member. So, let us at Nursing & Homemakers Inc. help you to plan proactively and strategically for the post-retirement years. For the past century or so, we have been living longer. And so as we age, we must make sure that homecare and long-term care are a part of our budgeted reality. These costs represent an important lifestyle choice. Let us help you to achieve peace of mind: let us help you to plan how your loved ones can enjoy having quality care or companionship while you work, play or rest. Whether day to day or in a health crisis, whether you need a few hours or respite or planning to go on vacation, we will provide excellent care for your loved ones. Our staff members are trained to deal with the stresses associated with the post-hospitalization period. We have been told our staff make compassionate, caring companions. Our vision at Nursing & Homemakers Inc. is to provide excellence in nursing practice and personal care in Ontario. Our mission is to provide innovative, safe, client-focused, culturally-sensitive nursing and personal care in a cost effective and efficient manner. Our organization takes patient safety seriously. As President and CEO, it is my responsibility to make sure that the strategic direction of the organization is shared with our team members and that such sharing leads to quality management and improvement of our various services. Strategic planning, patient safety, and quality improvement are not just buzz words for us at Nursing & Homemakers Inc. We recognize that these are critical imperatives to our operations. As part of our quality improvement plan, we align performance measurement and quality improvement with our strategic goals and objectives. Regularly, we conduct assessments and evaluations to confirm that we have met our goals and objectives. Patient safety, quality improvement and client satisfaction are key indicators of our continued success at Nursing & Homemakers Inc.
Our employees come from a variety of backgrounds; they speak over 70 different languages. We are accredited by Accreditation Canada. Nursing & Homemakers Inc. has received many awards including the Consumers Choice Awards for Excellence in nurse services. 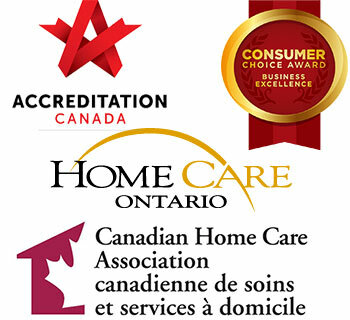 We are also a member of Home Care Ontario; Canadian Home Care Association and the Better Business Bureau. We have maintained an excellent reputation in the homecare and supplemental staffing industry in Ontario where we provide nurses, caregivers, dental hygienists, dental assistants and other allied health care workers to hospitals, long-term care facilities and to individuals such as you or your family when you prefer to remain in the comfort of your own home. At Nursing & Homemakers Inc., we are unique in the type of services that we offer and in the diverse range of our clientele. Our motto is “We are there when you need us most.” You can trust us to deliver on that promise. Our ethics and sound business practices are the foundation on which Nursing & Homemakers Inc. consistently delivers healthcare services of high quality. We actively embrace change and we continue to support our publicly-funded healthcare system that all Canadians have been privileged to access. For times when you require homecare services, Nursing & Homemakers Inc. is ready to provide care and support with our high quality personnel. On behalf of the staff, I welcome you to Nursing & Homemakers Inc. Please take an opportunity to browse our website and we hope that you will make NHI your agency of choice.